The Portuguese Podengo Grande belongs to the family of primitive sighthounds found throughout the Mediterranean. 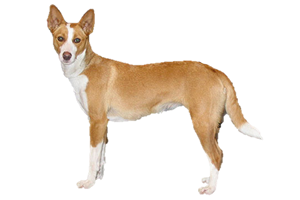 This includes the Cirneco dell’Etna, Pharoah Hound, Ibizan Hound, and the Podenco Canario. They are also the largest and oldest of the three Portuguese Podengos, the other two being the Portuguese Podengo Medio and the Portuguese Podengo Pequeno. In most countries these types are seen as varieties rather than separate breeds. However, the American Kennel Club currently recognizes only the Pequeno. The Medio and Grande are lumped together as a single breed in their Foundation Stock Service. The term ‘sighthound’ is a bit misleading as the Portuguese Podengo Grande uses sight, scent, and hearing while hunting. Originally they were developed to hunt large prey such as boar, wolf, bear and deer in packs. However, as this game diminished their skill was turned toward smaller animals like rabbit or hare. During a hunt they generally coursed alone or in pairs. Although the Portuguese Podengo Grande is capable of working as a gundog. As a secondary role they were sometimes used for guarding. The Portuguese Podengo Grande has existed in Portugal for centuries. However, how and when it arrived has been lost in time. Like the other Mediterranean sighthounds, the most commonly held theory is that their ancestors were brought to the region by the Phoenicians and were Egyptian hounds such as the Tesem. Unlike their cousins, the Portuguese Podengo Grande did not develop independently and isolated on an island, but rather the mainland. This left them influenced by countless other breeds. This outside blood not only created the Grande, it may have led to the development of the other two sizes. Some have speculated that the Medio was produced by the addition of Portuguese Sheepdogs to the bloodline, the Pequeno by small terrier-like dogs. ​Today the Portuguese Podengo Grande is extremely rare, even inside its homeland and is danger of facing extinction. For many years the Grande and Medio were interbred and in the 1800s it was heavily crossed with the Galgo Español, Greyhound, and crosses of the two. A decrease in popularity has continued to decimate what remains of their bloodline. Is the Portuguese Podengo Grande Right for You?